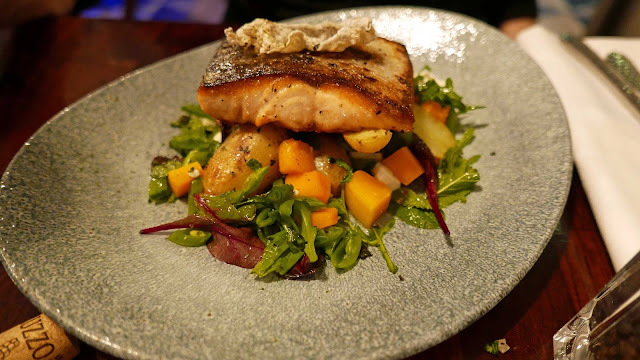 So here you are in the kitchen with this lot in front of you: Salmon, sugar snaps, mint, new potatoes, Toonsbridge feta, butternut squash, lime dressing. What to do? Well, check with Maria Raftery, the owner-chef at Kernel, Kilkenny’s newest restaurant. She grilled the salmon and put all the other ingredients together in a magical manner to produce one of the best salmon dishes you're likely to come across. It is one of the main dishes on the new menu at the restaurant which has taken up most of the front of the Kilkenny Inn on Vicar Street. 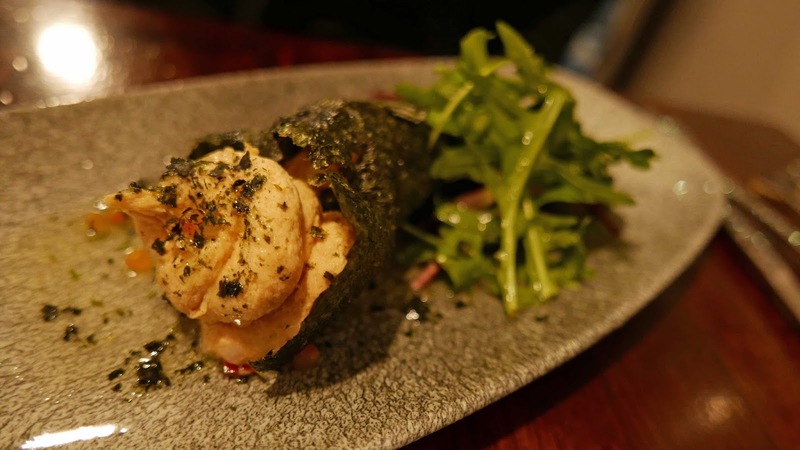 And the dish, and others, amply illustrate that Maria has lost none of her innovative qualities that shone through over 17 years at Zuni, also in Kilkenny. Kernel Restaurant and Bar, to give it its full title, will be running hand in hand with the hotel and is providing the breakfast for the lucky patrons. Brunch and dinner is also available, even afternoon teas for both ladies and gents! Back to our visit. 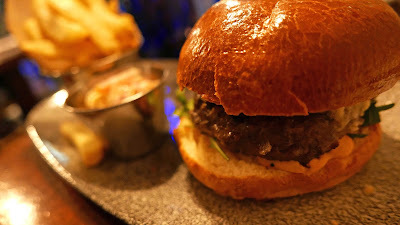 While CL was finishing off the salmon and singing its praises, I was tucking into something a little less complicated: the Kernel Angus Beef Burger, smoked Gubbeen, burger sauce, pickle-slaw, house fries. Less complicated maybe but still a perfect combination of textures and flavours. CL had started the meal with Goatsbridge Trout Ceviche, Nori Seaweed, Smoked Trout Mousse, Roe Dressing. Hard to beat that. 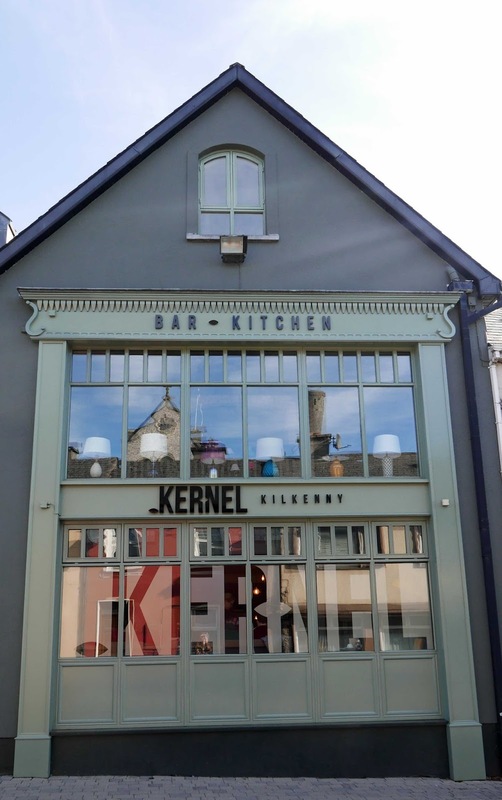 You’ll notice that Kernel has started by supporting local producers and Goatsbridge Trout Farm is one of the best. 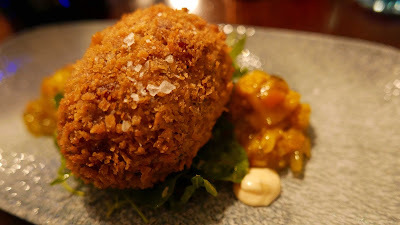 I didn't do too badly either with my Ham Hock Scotch Egg, Piccalilli. Lacked nothing in either quantity or quality, full of good flavour and a really satisfying opening to my visit to Kernel. 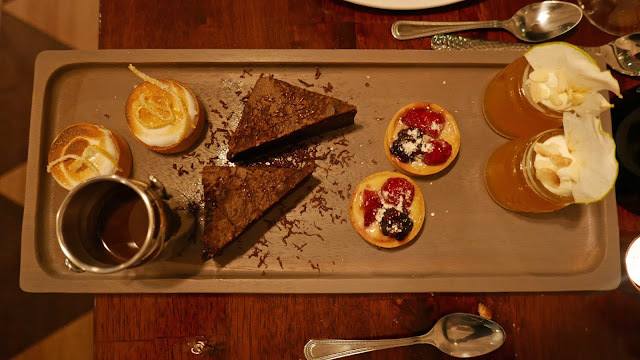 The dessert list is short but still left us puzzled, a puzzle we solved by ordering the Assiette of Desserts, a sweet solution. They’ve got a pretty good wine list, three suppliers contributing to a good balance overall. We made a bit of a compromise, an enjoyable one, on the Cantina Frentana, Montepulciano D’Abbruzo, fruity and smooth, and twenty five euro the bottle. Had noticed a few (quite a few actually) craft beers on the list including Franciscan Well, Costello’s, O’Hara’s, Free Bird and Hop Adventure (both from Carlow) and Falling Apple Cider (also Carlow). The taps on the bar heralded the three variations of Smithwick's (Red Ale, Pale Ale and the Blonde) but I'm sorry I missed out on the tap for O’Sullivan’s Malted Red Ale, a local beer (now revived) that was produced before Smithwick started in 1710. Next time!